While it may be hard to believe, Q4 is just around the corner. And since Q4 is historically the biggest quarter for most sales teams, now is the time for companies to identify any issues with their revenue funnel, and determine ways to fix those problems so Q4 is a runaway success, not a flop. But what happens if there are multiple issues with a company’s revenue funnel? Luckily there’s no need to go out and deploy six new solutions, as predictive marketing can solve a number of key revenue funnel issues simultaneously. Some of the funnel problems predictive analytics have improved for Lattice customers include: Conversion rates, deal size per account, deal velocity, marketing and sales efficiency, alignment between sales and marketing, and ad-spend efficiency. Segmenting the universe for ABM at scale: Most companies have a world of customers and prospects, but they need data-driven ways to create segments of these accounts so they can run hyper-targeted marketing campaigns and have hyper-personalized sales outreach. Prioritizing activity across inbound and outbound: Most companies have a mix of both outbound and inbound activities, but it’s unclear which campaigns and programs should be used most efficiently with each channel. Matching tactics to customer journey: Companies have a number of different tactics they use to move buyers through a sales cycle, such as digital advertising, and they need data to make these tactics more targeted and effective. 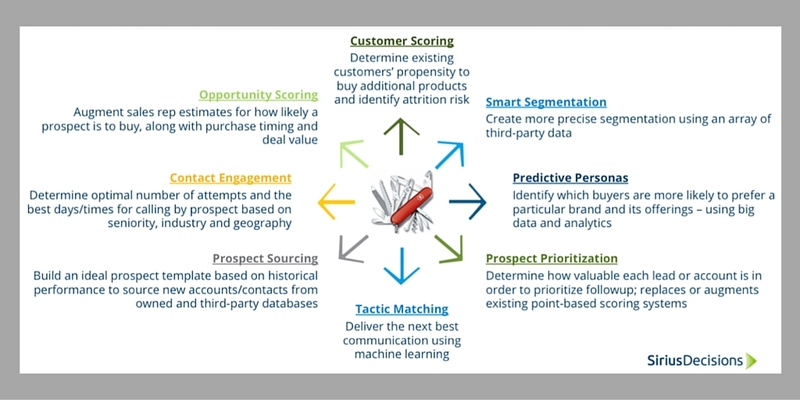 If you’d like to learn more about the Predictive Demand Framework from SiriusDecisions, and see how Lattice’s clients have fixed their funnel with predictive analytics and are now seeing real revenue results from predictive analytics, check out our recent webinar!